If you ever plan to use ice with your children for any reason please be sure you supervise at all times for safety purposes! Back in my days of working in the orthopedic clinic as a physical therapist I would talk about ice all the time. Patients iced shoulders, knees, hips etc. It was very common practice with sports injuries and post-surgery patients. I had an ice bag recipe that I loved. I especially loved that it didn’t freeze solid and it was something that patients could make at home. It reminded me of a gel pack versus a hard uncomfortable ice pack. It’s now come to my attention that ice packs will likely be common practice around my house again with C going like crazy. All this moving around has included some bumps and falls. I started experimenting after the last bump we had and customized a “cute” ice bag for very little cost. Have you ever heard of a custom ice bag? I liked my results! Simply add 1 part alcohol to 3 parts water and place in a freezer bag. Add some food coloring and even some sparkle if you would like. A little fun can make the injury a little more tolerable! I added yellow food coloring and poms to my ice bag. If you want it sealed even more add some duct tape. Again, remember not to let your child use this without proper supervision. Thanks to the rubbing alcohol, the ice bag gets really cold but never actually hardens making it nice and easy to manipulate. It makes it easy to really mold to the injured spot. If you are making an ice pack for an adult you may want to select a gallon size freezer bag to mold to larger areas. Instead of buying an ice pack why not make your own homemade ice pack? Maybe even customize it a little? Bring on the ice! Check out my store! It’s full of ideas for physical therapists, teachers and parents to incorporate movement with learning! I’d love to hear what you have to say. Let’s stay connected! You can find me on Facebook, Twitter, Instagram or Pinterest! Love this idea! 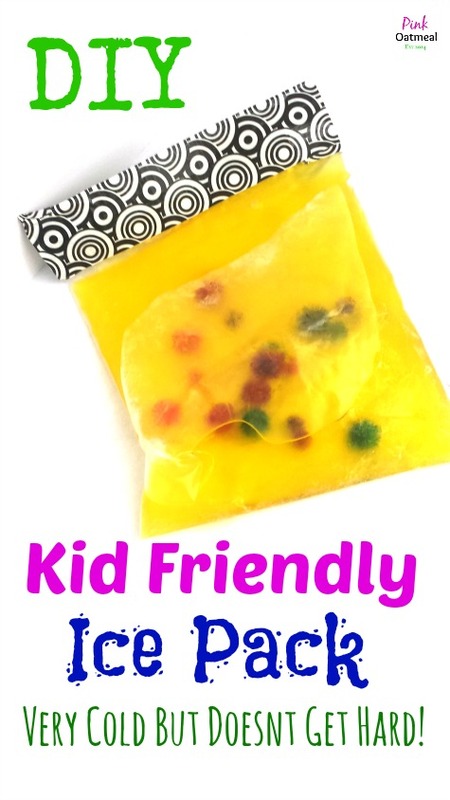 Would you consider this idea for using as an ice pack in a lunch box? Or, given the rubbing alcohol, perhaps it’s best to avoid using with food? That’s a really good question, I’m not sure of the answer. I suppose that if you made sure that it was really sealed tight and nothing could get out it would be fine but I’m only guessing! Fantastic idea! Tweeted it to all our followers and posted on our FB page. Thanks! Thanks so much glad you found it helpful! I wonder if mixing a bit of glycerin and xanthan gum and adding it to the mixture would make it a bit more gel-like without solidifying. That’s what I use to thicken soap nuts liquid for use as hand soap and it seems the liquid in the cold pack would stay in place on difficult spots like knees if it was a bit thicker but still readily malleable.